Gellert Spa is one of the most famous thermal spa baths in Europe, and one of the leading natural hot spring spa baths in Budapest, Hungary. Gellert thermal pools, swimming pool, wave pool and spa treatments offer a great relaxation and entertainment all year round. Visit Gellert Spa Bath and experience high quality relaxation at a fraction of the costs you would pay in any western country. Gellert Bath opened in 1918 offering medicinal water treatments using the same deep underground springs the Knights of St John used in the 12th century, and later on the Turks to feel the invigorating powers of the mineral rich waters. 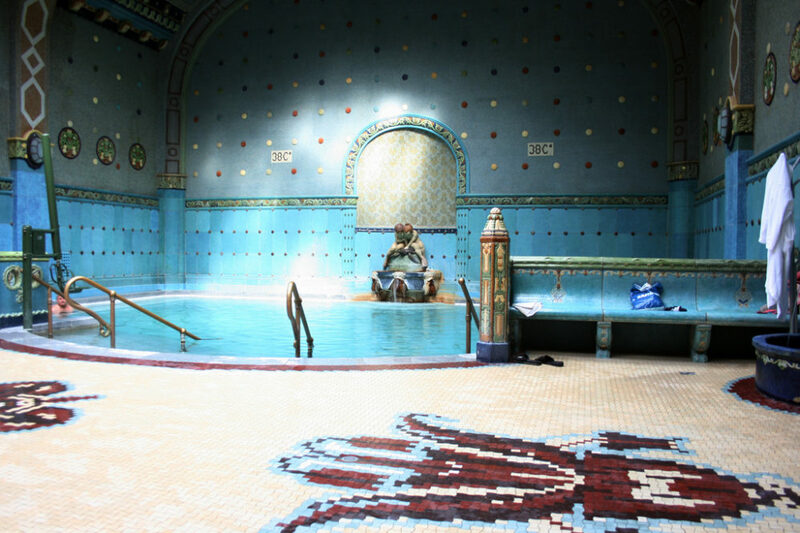 Come and visit our favorite bath in Budapest besides Szechenyi Baths: Gellert Spa Bath is the true gem of the thermal baths where you can easily spend a day, explore the numerous pools, get luxury treatments without having to feel crowded by other tourists. 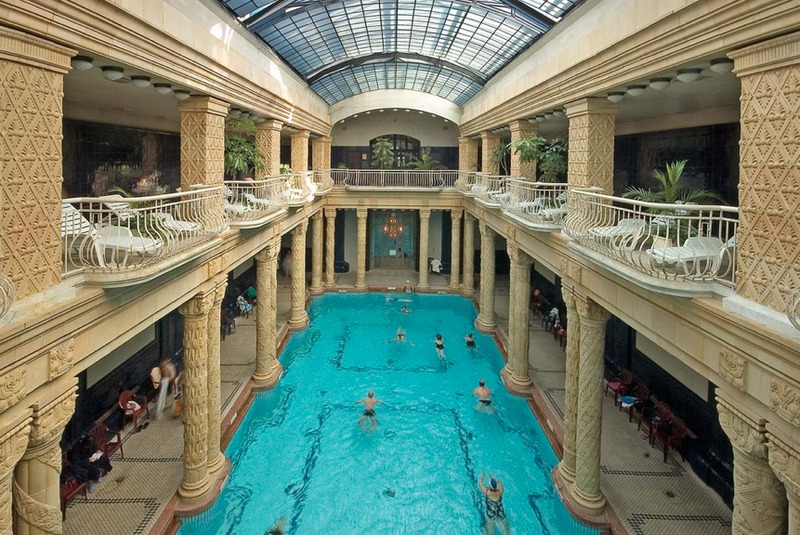 Spa and elegance await you in the Art Nouveau building of the almost hundred year old Gellert Bath. 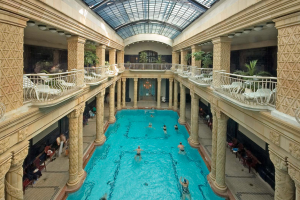 Gellert Spa is famous for its lovely warm spring water pools, its architecture, its landscape, and also for its spa treatments, and pampering massage therapies at reasonable prices. I just made a booking for the spa for Sunday 14th April, 5:00pm onwards for the Double Royal Thermal Massage (60m & 2GS Ticket & 2 Cabins) amounting to EUR176. I have received the confirmation of the payment from Paypal, but not received the confirmation email. Please confirm and provide confirmation. Your booking is valid and complete. As per the website and booking form, the actual massage hours of out of office hours bookings submitted after 6pm (such as yours) will be confirmed the following day until 11 am (local time Budapest). We will send you the final confirmation soon. I have made the payment for a 20 minute massage (12.00 o’clock) + spa ticket + cabin (50€) for today, 12.4.19. I still have not received a confirmation. Could you please confirm? Your massage will start at noon. I’ve just booked two tickets for a massage and visit to the spa, but have accidentally used the wrong email address so haven’t received my booking. Could it please get resent to me? I have forwarded your confirmation email to your correct email address. I just made a booking for the spa for Suturday 20th April, 3:00pm for the Foot Massage (20m & 2GS Ticket & 2 Cabins) amounting to HUF 24200. I have received the confirmation of the payment from Paypal, but not received the confirmation email. Could you please send me the confirmation? Thank you! as you have received your tickets in the meantime, all I have to say is enjoy your visit at Szechenyi Spa Baths!